THOMASINA - 1964 - ORIGINAL ONE SHEET (27 " X 41") MOVIE POSTER. POSTER IS IN EXCELLENT CONDITION WITH LIGHT FOLDS (AS ORIGINALLY ISSUED). THIS IS NOT A VIDEO OR REPRODUCTION POSTER , THIS IS AN ORIGINAL THEATRICAL MOVIE POSTER PRINTED BY NATIONAL SCREEN SERVICE. 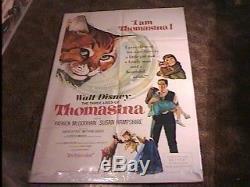 The item "THOMASINA MOVIE POSTER'64 VINTAGE CAT DISNEY" is in sale since Saturday, August 14, 2010. This item is in the category "Entertainment Memorabilia\Movie Memorabilia\Posters\Originals-United States\1970-79". The seller is "tloceposters" and is located in ROCHESTER, NY.